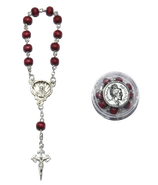 The rosary consists of ten or eleven individually chained fragrant, red rosewood beads and the St. James cross with corpus. 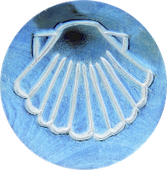 The scallop in the center shows a red St. James cross on its front and St. James on its inside. Comes with a storage box!